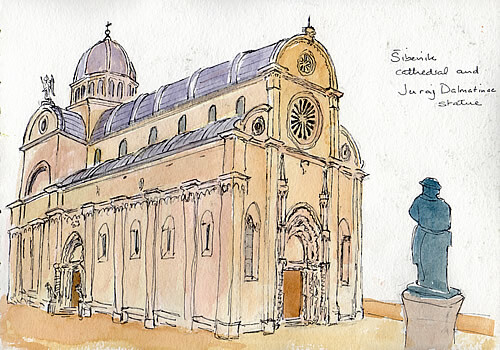 Road trip day 2 saw us in the delightful medieval town of Šibenik. It lies on a bay created by the river Krka, directly facing the fairly narrow channel where the river exits into the Adriatic. The natural harbour has made the town an important trade centre over the years, and this place is seriously defended by no less than four fortresses – three above the town, and one guarding the channel. There’s a wealth of natural resources in the surrounding area, including the beautiful Krka National Park. 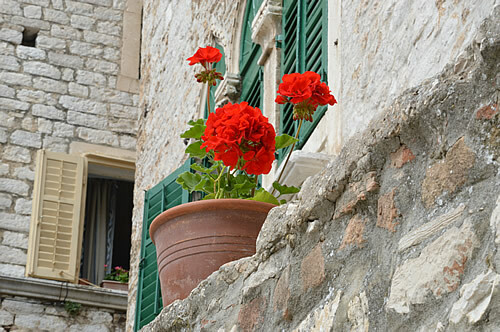 Šibenik itself is a classic medieval town with narrow winding streets and jumbled-together houses. It’s built up the steep hillside overlooking the harbour. The old part of town is for pedestrians only (almost everywhere), and you have to park your car and walk. 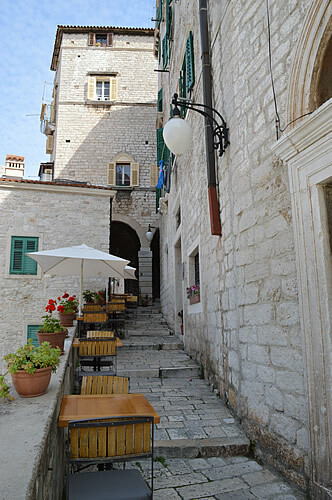 The main streets go across the hill, while steps lead you down to the waterfront or up to the defending fortress. 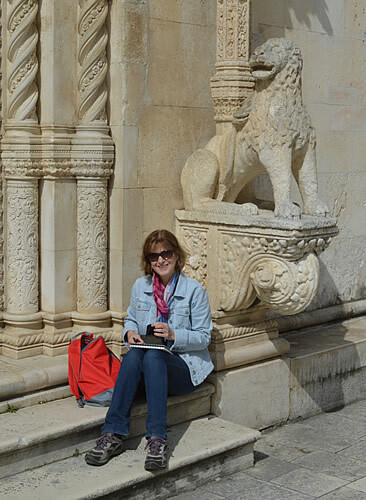 We’re staying in the Medulić Palace Rooms & Apartments, right in the heart of the old town. Our room is lovely, all very modern and comfortable tucked inside an old medieval building – yes, it really is the old Medulić Palace! Our hosts are very friendly and considerate, even to welcoming us with homemade cake! And this is a great position from which to explore the town! Many of the old buildings around town appear to have been adapted from even older ones. You can see where a new facade has been added, or a renaissance portal has been incorporated into more modern, say 17th or 18th century architecture. 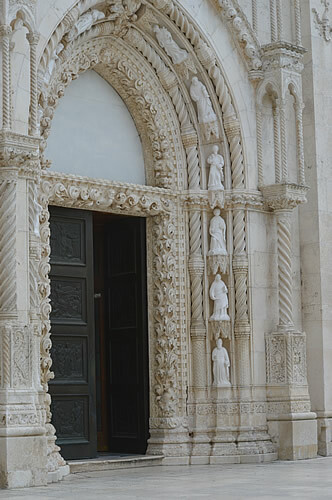 Šibenik’s most famous building is its cathedral, as fine a piece of stone carving as you’ll see anywhere. The chief architect and stonemason was Juraj Dalmatinac (which is to say, George the Dalmatian), who was a truly inspired craftsman. 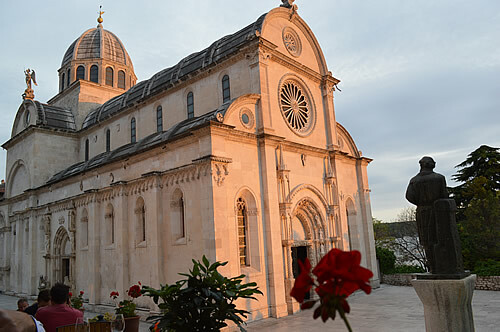 The cathedral was built between 1431 and 1535 at a time when Šibenik was prosperous and expanding greatly. 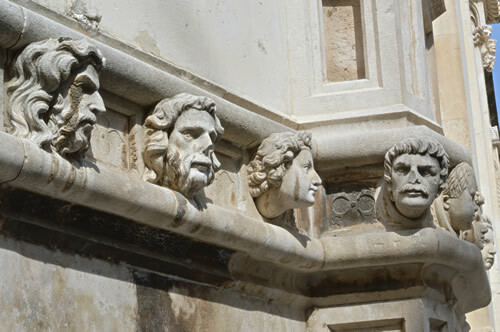 The carved heads on the facade are said to be portraits of the local townsfolk, and if you didn’t pay your contribution, you may not have liked how you were represented! It’s amazing to think that these 15th century citizens are still here today, immortalised in stone. Some of them don’t look at all happy about it! The Cathedral of St James is a UNESCO protected heritage site, a church like no other. Built in the gothic/renaissance tradition, but with none of the features of other contemporary church buildings. The construction is entirely of stone, so the inside and the outside are the same shape. 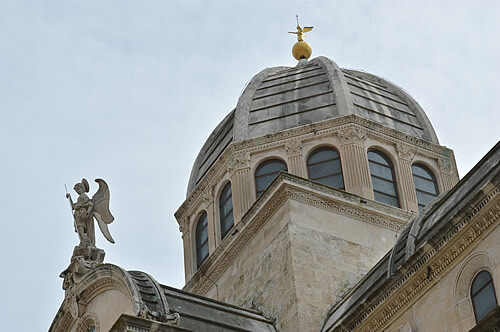 The method used for building the dome and vaulted roof was Juraj Dalmatinac’s own solution derived from woodworking techniques – shipbuilding perhaps or cabinetry. The stone comes from the island of Brač and is really high quality, which was crucial for making the pieces fit perfectly. 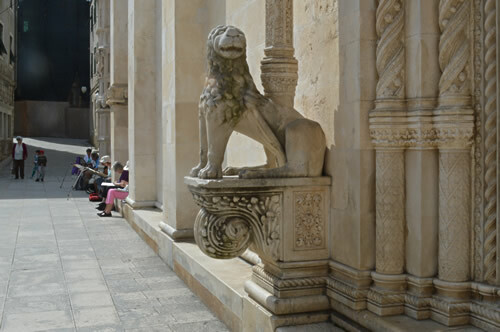 In the morning, there’s a group of artists sitting on the stone benches of the cathedral, painting the old town buildings on the opposite side of the pijaca. How very strange, I thought, but perhaps they’d already had a session painting the cathedral itself? 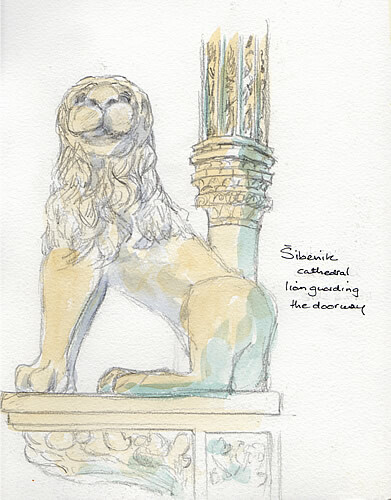 Me, I chose to sit and sketch one of the lions guarding the side portal. It was a good position, nice and shady, and I could listen to the choir singing inside. At the end of the service, though, the emerging crowd rather blocked my view of the lion and I was forced to retreat! 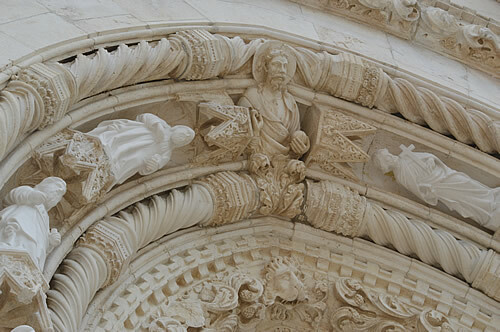 Round the front of the cathedral, the carving surrounding the main portal is a gorgeous confection. The otherwise plain stone walls really set off the detailed work beautifully, and it’s all at a nice scale so you can see it. 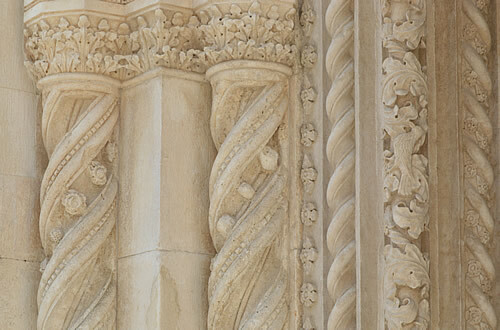 Here’s a closer view of the top part of the main portal, showing how the scrolls of the pillars wrap very prettily around Jesus’ halo! The paler figures here would appear to be recent replacements, part of the ongoing maintenance and restoration work. 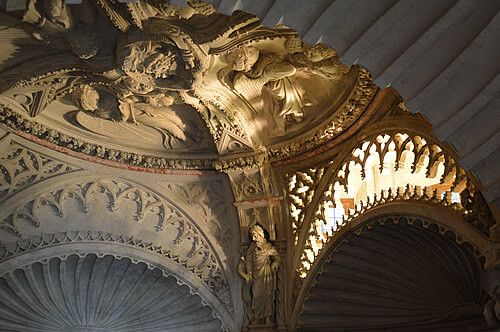 Inside the baptistry, three cherubs hold the font, while the carving on the ceiling is gorgeous. It’s a tricky operation to time your photographs, as the tour groups ebb and flow – this is a popular sightseeing trip it seems! Back outside, the more you look, the more you see – a small bird on the curling leaves here, a dog and a small lion tucked in there. It’s all very lively and flowing. 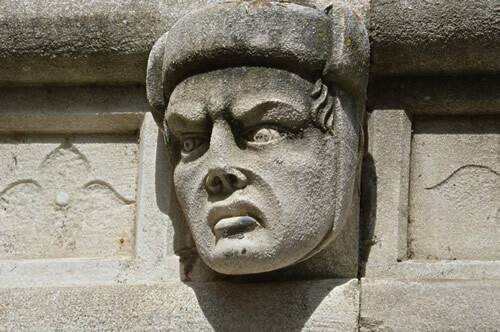 After seeing this, other church carvings look particularly static in comparison! Lion portal – see the bird amongst the leaves? 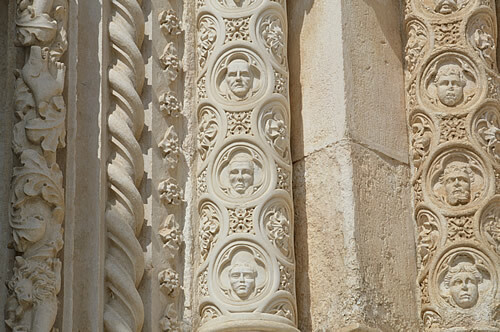 More faces on the pillars here, each one a different individual – and again there’s wildlife among the leaves! Carving detail – see the dog and the lion in the leaves? 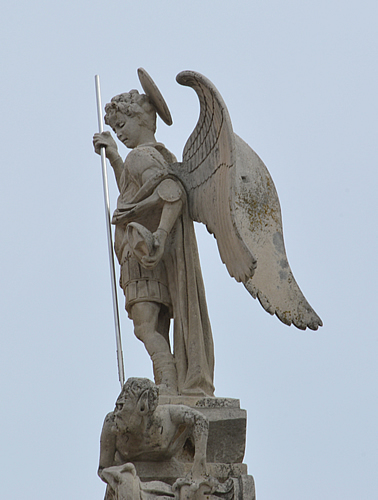 And let’s take a closer look at that angel standing up on the roof – he’s standing on some kind of griffin creature with claws and pointy ears. Not the original gollum, surely? Now here’s a different angle on that lion I was sketching. As you can see, the frontal view is quite detailed, which altogether escaped me from where I was sitting! 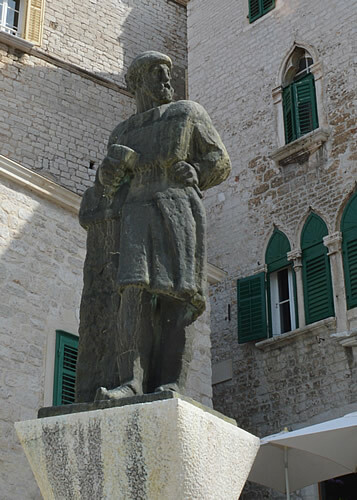 Across the square facing the cathedral is a bronze statue of the master of works himself, Juraj Dalmatinac by the renowned 20th century Croatian sculptor Ivan Meštrović. Juraj is standing with his stonemason’s tools, looking proudly at his masterpiece. 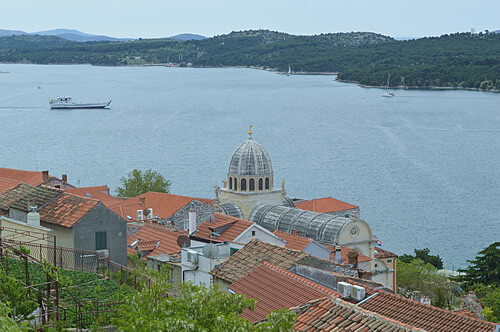 Šibenik is a very pleasant city to walk around, down to the waterfront where the boats are docked, and cafes and restaurants line the street. 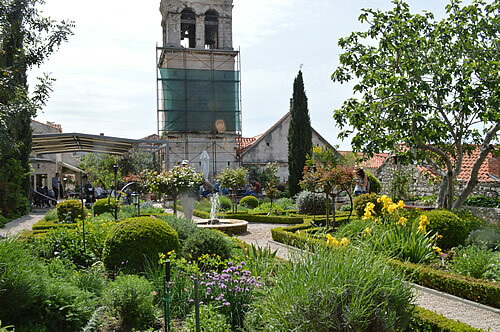 Then upwards towards the main fortress, stopping off in a little Monastery garden, a peaceful oasis with coffee shop and ice cream. It’s a welcome relief on a hot day. The monastery itself is undergoing some renovation, so sadly the belltower is not looking its best for the photo! The garden is full of herbs and medicinal plants, each neatly labelled. 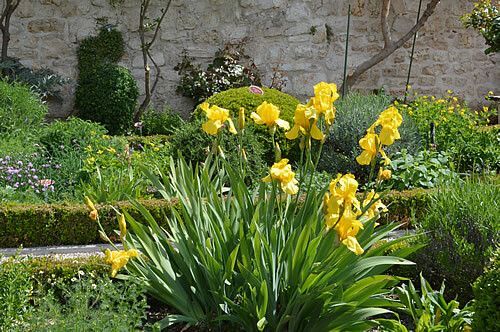 There are some beautiful irises in flower too. 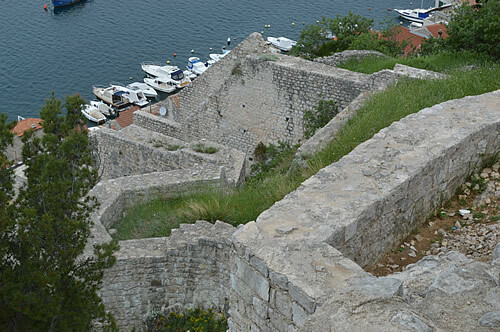 St Michaels fortress rises above the town, protecting it from enemies. 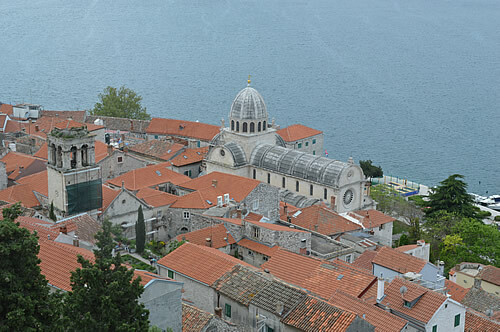 As we climb up, we have glorious views over the roofs of the city below and out over the harbour. Zig-zagging downhill from the fortress is the old city wall. It looks very impressive from above. 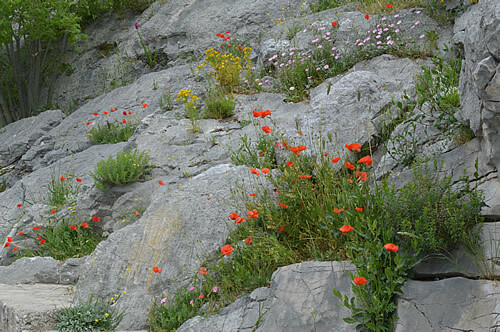 Continuing on the path round the fortress, there’s a lovely display of flowers – a natural rock garden. May is the time for wildflowers, and the poppies make a pretty splash of red! The open space inside the walls of St Michaels fortress is a beautiful outdoor concert hall, which must be a spectacular venue for any performance. Sadly it’s too early in the season and there are no events scheduled during our short visit. Back down the hill, Šibenik’s Gradski Muzej (Town Museum) was a delight, with a beautifully presented history of the area. 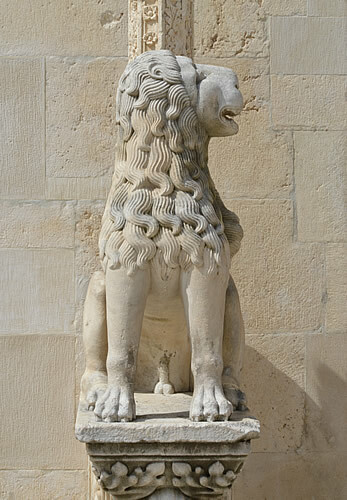 For starters, it’s inside the old ducal palace, itself a local monument. The museum covers from prehistory right through to the end of Venetian rule, and left me wanting to see more! 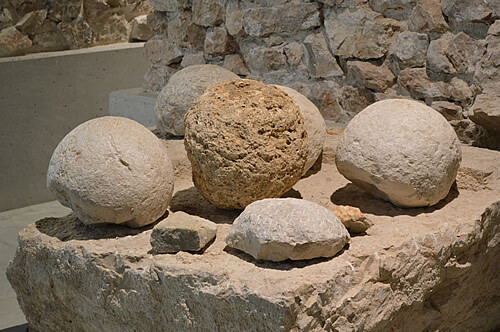 They have a wealth of artifacts, very thoughtfully displayed with diagrams and explanations in Croatian and English. The addition of creatively constructed tableau really brought it all alive and helped give an understanding of what we were looking at! Totally modern with touchscreen displays to explain all. Very impressed. 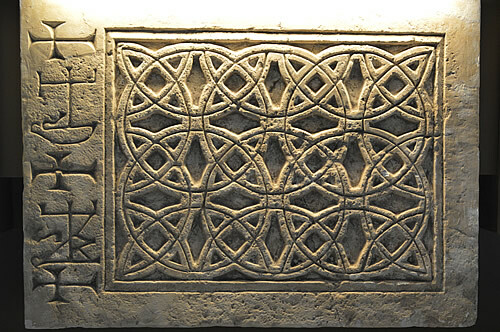 Stone relief pattern looks almost Celtic to me! 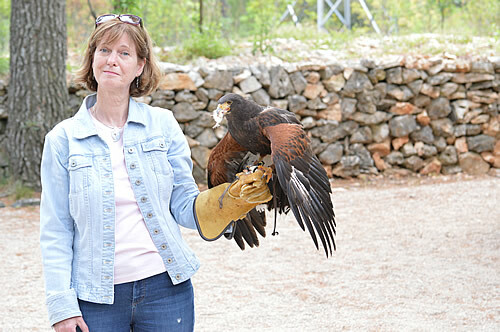 After visiting the museum, we headed out of town to the Sokolarski Centar for Falconry & Raptor Rescue in nearby Dubrava. This is a veterinary centre that rescues and rehabilitates wildlife. 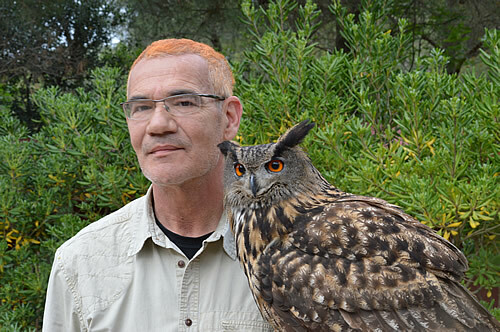 They have their trained falconry birds on show, as well as a rather magnificent eagle owl. The injured wild birds are kept separate, away from the public as they will be returned to the wild when able, and it’s not good for them to get too accustomed to people. We’re treated to a highly entertaining and ever so informative demonstration of the birds by project manager Emilio Menđušić, given in a mixture of Croatian, English and French (we visited at the same time as a group of French folks). I learned such a lot and actually got to hold the Harris hawk for the falconry display! What an extraordinary privilege that felt. See separate article: Enraptured by raptors on the Dalmatian coast – it was such a highlight of our trip! We had quite the medieval theme going today, as falconry was very popular at that time. Apparently it was quite common for women to keep hawks for hunting, supplementing the family dinner. No veggies back then! Talking of dinner, that was at the wonderful Konoba Pelegrini, recently voted the best restaurant in Croatia. It’s beautifully located overlooking the front of the cathedral, and what a fantastic sight in the golden colours of sunset. The food was superb, the service was outstanding, in fact the entire evening was just very special. We can quite see why this young chef/owner is winning national awards! Read all about it in An extraordinary fine dinner at Pelegrini. 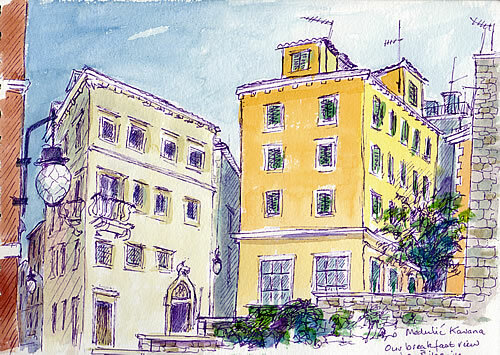 And tomorrow we’ll be off to explore the upper reaches of Krka National Park – sketchbook and camera at the ready! Meanwhile, here are today’s sketches. In the first one, I filtered out all the messy construction work going on as the building on the left is currently being converted into a luxury hotel. Ah, the advantages of a sketchbook over a photograph! Love the Šibenik streetlights, too! And the whole cathedral, as seen from our table at Pelegrini. Such an elegant building.